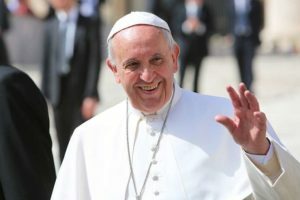 Leader of the Roman Catholic Church, Pope Francis has admonished Christians to shun hypocrisy, adding that it is better to be an atheist than a hypocritical Christian. 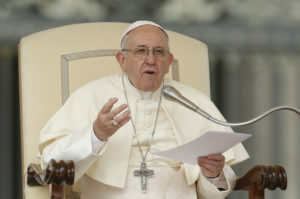 Pope Francis speaks during his general audience in St. Peter’s Square at the Vatican April 18. (CNS photo/Paul Haring) See POPE-AUDIENCE-NAME April 18, 2018. News Agency of Nigeria reports that the Pope gave the warning during mass on Wednesday at the Vatican City, Rome, while criticizing hypocrites in the Catholic Church. The cleric said hypocrites frequently parade themselves in church only to cause havoc and live double lives. At mass, the 1.3 billion Catholic’s leader demonstrated his ability to connect with regular people in the world as he received members of the Cuban National Circus and had fun by laughing with dancing artists and balancing a ball on the tip of his finger.